What coaching is is a way for you to move past thought patterns and structures that limit and confine you to the results you have been achieving and experiencing. Everything you do in life, through work, love, family, finance and everything else is dependent on the thought processes you engage. Coaching is distinctly different from mentoring and while both can bring you great results is worth noting that coaching is what elevates your own personal qualities and yields you a greater ability truly to outshine. So what is mentoring? Mentoring is what you get when you have someone who has done what you are doing before. That person is guiding you through what you do and advising you based on their own experience and learning that they acquired. As such you are opening yourself up to gaining similar results to them. As such it can in many ways limit your own potential due to the fact that your personal abilities could be grown beyond that of a mentor. So what is coaching? Coaching is a set of processes which cause you to move beyond the barriers and limitations within your own mind that cause limitations with the results you experience in the outer world. From an NLP standpoint we are talking about things such as limiting beliefs. These limiting beliefs are deep down at an unconscious level and few ever have any awareness of them, except for the results they experience around them, externally. Your world is shaped by your values and beliefs, and it is their nature that gives rise to your behaviour and your perception of the world around you. It is through belief change and values work, reshaping the way in which you view the world that greater results become possible. In short through cleaning out the mental processes which bring limitation you immediately open yourself up for greater things. As soon as you have effected that change you achieve a whole new level of clarity and ability to discern other options which were previously impossible to see. Options which then bring you the ability to attain ever greater heights and results. 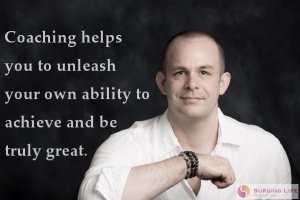 That is what comes from coaching, unlocking your own innate ability to achieve amazing things. Something noted by various key organisations including the NIH, NHS and more. These can be useful, the option for learning effective strategies and methods can be incredibly useful, especially when combined with unlocking your own deeper qualities and vision. The challenge comes from finding someone to work with who is able to let you grow effectively. Someone who feels comfortable with you outshining and outperforming them. Because that is what should happen, once you are really firing you should outperform your coach and mentor. For many this is almost impossible due to ego and pride. The thought that your ideas could perform better than their proven methods is unthinkable to many. So what is the best thing to do? This is why pure coaching is in many ways far more effective. That is provided you have the right coach. The right coach realistically is someone who knows very little about what you do, when talking about business and executive coaching that is. In many ways the less they know the better. The reason for this? By knowing little or even next to nothing, or at least removing that knowledge and desire to advise on it from the process, they can aid you more effectively to find innovative and fresh solutions that can give you the edge to achieve your desired results. What coaching is after all is a set of processes designed and delivered in such a way as to aid you in becoming the best you can be. You are different from everyone else and that which makes you different makes you special. Being comfortable with that and even embracing it is one of the first things that can raise you ability to reach your potential. If you were the same as others then you would be confined to their results too. The right coach helps you to unlock your capacity to achieve that which you are capable of, which is far higher than many and even you may believe. In knowing little about what you do the ability to bypass processes which limit others becomes possible. The right coach is someone who can aid you to achieve clarity on where your thoughts and mental processes have limited your results. Moreover they can help you to manoeuvre beyond them in such a way that an amazing field of possibility then stretches out in front of you. Bringing you the ability to surpass in previously indiscernible ways that had alluded you. That is what having the right coach does for you. In simple form it is something which frees you from limitations. Limitation from your own unconscious thoughts, beliefs and values. Limitation from the unconscious thoughts, beliefs and values of others. Granted these things can be achieved through other techniques such as meditation, ho'oponopono and other similar techniques. The speed of change is dramatically different when compared to coaching. Through meditating and practising other such techniques it could be a very long time before you experience major changes, with coaching you should be achieving real change every session. Of course augmenting your coaching program with additional techniques is an incredibly good thing to do, indeed meditation is strongly recommended for a wide variety of reasons, many of which you can discover on the benefits of meditation page. Those techniques are extras, it is well worth knowing that working with a good coach brings you opportunities for change and progress, that you would likely never have achieved through other techniques. It opens you up to realms of possibility and opportunity that with previous thinking would have been unfathomable and impossible to discern. It unlocks your ability to to achieve, in ways that previously may have been unimaginable to you. When you work with the right coach their directed questioning and conversation leads you to unleash your own ability to achieve, and be truly great. It takes your personal growth, and your ability to accelerate your personal development, in an incredible way. That is what coaching is. And when you get NLP coaching this moves to a whole new level.